DOCTOR WHO: Remembering The Sun Makers | Warped Factor - Words in the Key of Geek. Tony Fyler takes on a taxing story. 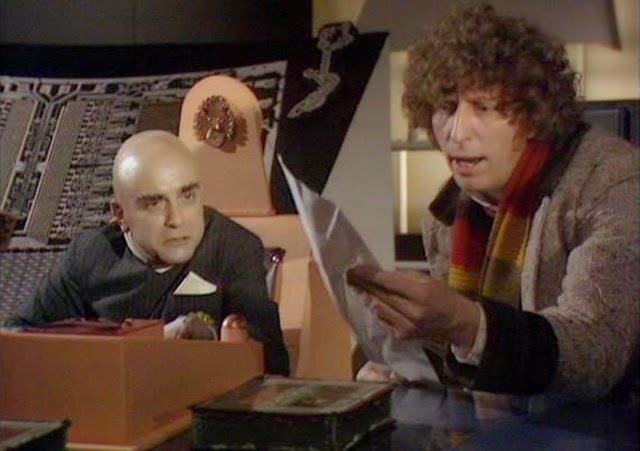 There can be little doubt that Robert Holmes was one of the great writers of the Classic era of Doctor Who. Some people, unafraid of being beaten up by Terrance Dicks, would even argue that he was the great writer of the Classic era. When Holmes got a bee in his bonnet, it would almost invariably result in satire, liberally soaked with lemon juice and not a little vitriol. Militaristic imperialism – The Time Warrior. Disposable consumerism – Spearhead From Space. Political grubbiness – The Deadly Assassin. The War on Drugs – The Caves of Androzani. Factory farming – The Two Doctors. When a man like that runs foul of the Inland Revenue and that most invidious of social necessities – the system of taxation – good things are going to happen, you just know it. The Sun Makers is a thing of satirical beauty, inspired by Holmes’s experiences with the taxation system. It bristles with wit and a deliciously waspish humour, but never let it be said that The Sun Makers is a thing in which subtlety or multiplicity of viewpoint ever raise their grubby storytelling heads. No, right from the outset, the world in which the story will unfold is laid before the viewer in primary colours and broad strokes. In the future, on Pluto, the workforce is held down by an oppressive, ever-changing, ever-increasing tax regime, with local tax gatherers living like kings off the sweat of the labouring classes, and the Collector at the heart of the system, rigging it towards profits for his ‘company’ at the expense of every human decency. The first scene paints the whole world for us – Citizen Cordo, a D-grade worker, has been working double-shifts to raise the death taxes to allow his father a decent funeral, only to find when he presents the money that an unexpected tax hike means he will be trapped in a debt-spiral for the rest of his increasingly miserable life. There is no way out of the spiral, so he determines to kill himself and let the taxes be someone else’s problem. 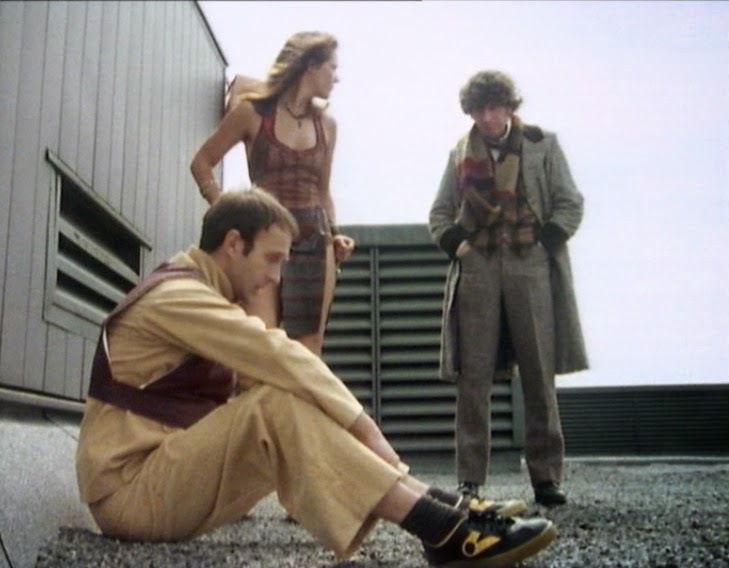 From the moment of the failed fraud, the Doctor is a figure of opposition to the Gatherers and the Collector – in fact to the whole operation of the sun makers (Rather oddly, the name of the story comes from the barely significant but still satirical fact that ‘the Company’ are the firm who have installed miniature suns in orbit around Pluto, allowing it to sustain life after the original sun goes supernova. The idea of being taxed for sunlight is Holmes going just about as far as can be imagined in the satirical vein, but as a concept, it’s barely mentioned enough to be significant throughout the story). There’s a good deal of running about – Leela, having defended herself against imminent throat-cutting, goes to rescue the Doctor from a detention centre where he has been taken, post-gassing. He’s already escaped, naturally, but she frees his detention-mate Bisham, and the two, reuniting with Cordo and the gang, begin the revolution almost by accident as they try to escape. Bisham is useful in that he knows how order is maintained on Pluto – by means of a gas in the ventilation system (Holmes perhaps inspiring Terry Nation there, with a pacified populace going on to feature strongly in the control methods of the Federation in Blake’s 7). Knocking that out allows the oppressed to wake up (as if from a fog of X-Factor complacency and iPhone serenity) and realise they’re mad as hell and they’re not going to take it any more, and the revolution gathers pace to its inevitable, bloody conclusion, with Gatherer Hade – the scumbag du jour played with relish by Richard Leech as an example of all that’s wrong with a system where taxes are more important than liberties and where mediocrity rises to prominence and power (think George Osborne or Ed Miliband, depending on your political preference, and then add a stupid hat) – eventually being thrown, in a delicious moment of full circle ‘natural’ justice – off something very high by a band of revolting citizens. 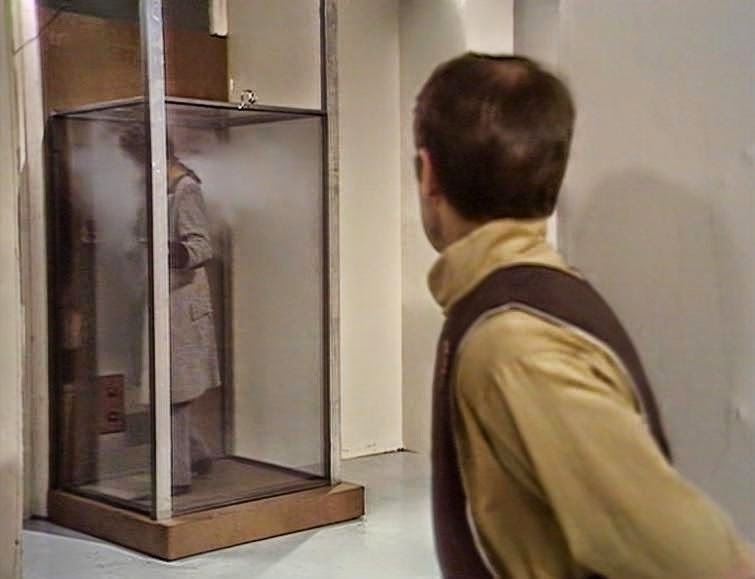 Then all that’s left is for the Doctor to Do Something Clever – which he does, introducing a hyperinflation loop into the Collector’s computer projections. The shock of spiralling, uncontrollable, inflation forces the Usurian (Yes, really. He’s a Usurian, from the planet Usurius, running a planet based on usury – I did say it wasn’t the most subtle of satires) to revert to his natural fungal form, where the Doctor traps him, allowing Pluto to break free of the grip of the sun makers. How it will fare in the grip of rampaging mobs of anarchists is a question Holmes refrains from answering, as the Doctor and Leela slip away quietly during the looting. The Sun Makers, as we’ve said, is not a subtle thing. It’s a sledgehammer satire on what happens when, to quote the Doctor, there are ‘too many economists in the government’ – it should be noted that for all the inferences that the sun makers are a private enterprise, the Usurian Collector had bushy eyebrows that have been notably compared to those of the Labour then-Chancellor, Dennis Healey, and certainly it is by no means a privilege of the left, or the poor, to complain about high taxation, so while being at the time a distinctly political rant in four episodes, The Sun Makers is broad enough to be enjoyed at any time, by any viewer. What’s more, it’s Holmes on fire, with director Pennant Roberts matching the vision of oppression with a kind of almost stale, life-drained look to the piece. 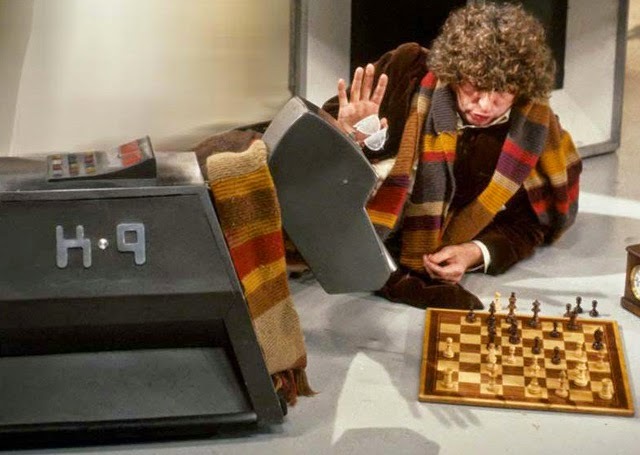 Roberts and Holmes were also Louise Jameson’s dream team and both Leela and K9 get plenty of chances to shine in The Sun Makers, adding life and spark and comedy to a story that could easily have become a tedious lecture. Both Richard Leech as Gatherer Hade and more remarkably Henry Woolf as the despicable Collector, turn in performances that help make an essentially hilarious idea seem more grittily serious than you might imagine, and guest stars including Michael Keating before he was Vila (again, evidence of a thread between The Sun Makers and Blake’s 7) help bring the piece to life in a way that would for instance have been sorely needed after the downbeat scarefest of the previous story, Image of the Fendahl, and which would be rather lacking in The Underworld, the week after The Sun Makers finished. While it’s unlikely to appear on many people’s Top Ten lists, The Sun Makers is still, watched some 37 years later, eminently enjoyable, satirical dark chocolate fun science fiction. Stick it in your DVD player today and fight the power!